Software that claimed to provide increased privacy whilst surfing the web has been criticised by computer experts and the blogging community. The application Browzar has been branded "adware" by many because it directs web searches to online adverts. Some technical experts also say Browzar, which claims to leave no trail of webpages visited, does not work. Browzar's developers say they are examining the feedback but strongly deny that it is adware. Mr Ajaz Ahmed, founder of internet service provider Freeserve and the man behind Browzar, told the BBC News website that he thought people were misusing the term. "This is not adware at all," he said. "Like every search engine, Browzar has sponsored advertising." Adware is typically a piece of software that generates advertising on a user's computer. The Browzar website states the application contains "no malware, no spyware and no adware". Browzar is an "Internet Explorer shell", a program that sits on top of Microsoft's popular browser to change its look and some of its functions. It is a free download and is offered as a "beta", or test version. 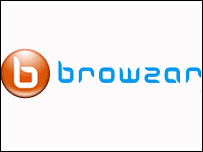 To use Browzar, people must download a small application from the developer's website and must have Internet Explorer (IE) installed on their computer. When the program is running, it looks similar to many web browsers, with a main page, address bar and home page button. The default home page, which cannot be changed on the current version, is the Browzar search engine. In addition, Browzar has a search box in the top right-hand corner, labelled "Search the Web...". Mr Ahmed says the layout is modelled on the homepage of the open source browser Firefox. When a user searches using the Browzar search engine or the search box many of the results are for sponsored links or adverts. These are included within the search results, rather than in a discrete "sponsored links" section, as on many search engines. For example, searching for BBC in the search box displays "Find 'At the BBC Recordings on eBay" as the first result. Underneath, the page says the link is "sponsored," meaning it is a paid-for advert. Other results direct users towards BBC pages. The paid-for sponsored links are generated by a program known as "Overture", developed by web giant Yahoo, and designed to display adverts based on keywords in the search term. Overture is used by many search engines and sites including ITV, Lycos and Altavista. But many of these sites keep sponsored links separate to search results. Browzar does not. In a post on the Techcrunch blog, titled "Is Bowzar just an adware machine", Michael Arrington wrote: "Browzar appears to be nothing but a simple shell to IE which forces Overture ads on its own users." Another blog, web3.0log, posted a story titled "new secure browser browzar is fake and full of adware." But Mr Ahmed says that users are under no obligation to use the Browzar search engine. "You can use whichever search engine you want with Browzar," he said. "Just type in the address and you can use Google, MSN, Yahoo or Ask." Browzar has updated its FAQ page to make this clear to users and is considering changes to the browzar site. "We are looking to enhance our search and change the way it is presented, based on feedback," said Mr Ahmed. Browzar claims to wipe any traces of a user's online activities. The developers say it is designed for people using shared computers who do not want to leave a trace of the websites they have visited and the terms they have searched for on the web. The developers say it does this automatically by deleting all files associated with websites when the application is shut down or by not storing them in the first place. Many web browsers, including Firefox, IE and Safari, already allow users to do this manually. Mr Ahmed said at the time of its release: "Although it's possible to delete history folders and empty cache with existing internet browsers, the majority of internet users worldwide don't have the time or expertise to do this. "There is no free method that offers the freedom to surf the web privately that is as simple and easy to use as Browzar. "It doesn't keep copies of pages that have been visited or retain details that have been entered into online forms." But some experts claim to have already shown that this is not the case. Scott Hanselman, writing on his blog Computer Zen, claims to have been able to find records of websites he had visited with the program installed. "Browzar, at least this version, is totally not doing what it says it does," he writes. Mr Ahmed said that he had contacted Mr Hanselman. "We're asking him to provide details of how he did so, so that we can make the necessary changes," he explained. "We have done extensive testing but there maybe certain configurations that cause problems. "